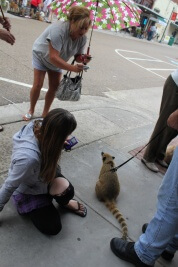 I suppose it’s my duty has matriarch of the Coati Cottage to make public appearances. The nearby town had a pet fair much like the last one I went to but, larger. They advertised it for everyone to bring their pets and had many contests for different pet categories like the biggest, the littlest, cutest costume, most unusual, longest tail and lots of other stuff. It was very nice of the town to invite all the other animals (just to make them feel good) when I know this was all done for me. My public demands it of me, plus I really like people. 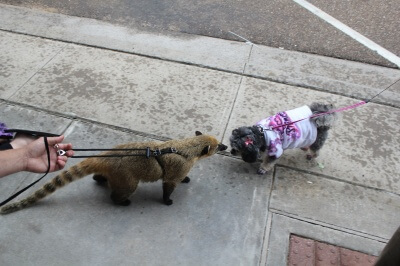 I got to meet many interesting pets and people. I like the kids the most! They are so easy to get treats from *giggles*. 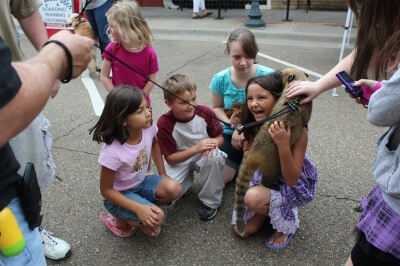 I met the coolest ferret lady, we really hit it off, that’s her in the picture with the long braided hair. 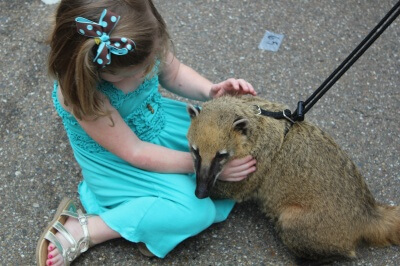 Just between you and me, I think she wants to be a CoatiMom. Can you be a ferretMom and A coatiMom at the same time? Wouldn’t that make you a ferroatiMom LOL? 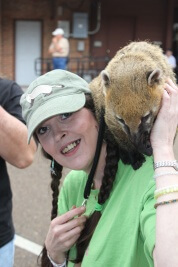 Oh well, me and my CoatiDaddy had another great day and made lots of awesome new friends while CoatiMom took photos. Oh, I got a special announcement, stay tuned for my next blog! It so wonderful, It get a blog of it’s own….